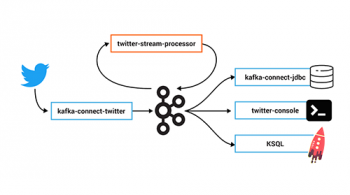 Kafka Connect is part of Apache Kafka®, providing streaming integration between data stores and Kafka. For data engineers, it just requires JSON configuration files to use. There are connectors for common (and not-so-common) data stores out there already, including JDBC, Elasticsearch, IBM MQ, S3 and BigQuery, to name but a few. For developers, Kafka Connect has a rich API in which additional connectors can be developed if required. In addition to this, it also has a REST API for configuration and management of connectors. If I write to my target in JSON, must I use JSON for my topics? Kafka messages are organized into topics. Each message is a key/value, but that is all that Kafka requires. Both key and value are just bytes when they are stored in Kafka. This makes Kafka applicable to a wide range of use cases, but it also means that developers have the responsibility of deciding how to serialize the data. In configuring Kafka Connect, one of the key things to standardize on is the serialization format. You need to make sure that anyone reading from the topic is using the same serialization format as those writing to the topic. Otherwise, confusion and errors will ensue! Schema. A lot of the time your data will have a schema to it. You may not like the fact, but it’s your responsibility as a developer to preserve and propagate this schema. The schema provides the contract between your services. Some message formats (such as Avro and Protobuf) have strong schema support, whilst others have lesser support (JSON) or none at all (delimited string). Ecosystem compatibility. Avro is a first-class citizen in the Confluent Platform, with native support from the Confluent Schema Registry, Kafka Connect, KSQL and more. Protobuf, on the other hand, relies on community contributions for partial levels of feature support. Message size. Whilst JSON is plain text and relies on any compression configured in Kafka itself, Avro and Protobuf are both binary formats and thus provide smaller message sizes. Language support. Support for Avro is strong in the Java space, but if your company is not Java based then you may find it less easy to work with. No, not at all. The format in which you’re reading data from a source, or writing it to an external data store, doesn’t need to have a bearing on the format you use to serialize your messages in Kafka. A connector in Kafka Connect is responsible for taking the data from the source data store (for example, a database) and passing it as an internal representation of the data to the converter. Kafka Connect’s converters then serialize this source data object onto the topic. The same happens in reverse when using Kafka Connect as a sink—the converter deserializes the data from the topic into this internal representation, which is passed to the connector to write to the target data store using the appropriate method specific to the target. What this means is that you can have data on a topic in Avro (for example), and when you come to write it to HDFS (for example), you simply specify that you want the sink connector to use that format. Kafka Connect takes a default converter configuration at the worker level, and it can also be overridden per connector. Since using the same serialization format throughout your pipelines is generally a good idea, you’ll often just set the converter at the worker, and never need to specify it in a connector. But maybe you’re pulling data from someone else’s topic and they’ve decided to use a different serialization format—in that case you’d set this in the connector configuration. Even though you override it in the connector’s configuration, it’s still the converter that performs the work. Connectors that are written properly never [de]serialize the messages stored in Kafka, and always let the configured converter do that work. Remember, Kafka messages are just pairs of key/value bytes, and you need to specify the converter for both keys and value, using the key.converter and value.converter configuration setting. In some situations, you may use different converters for the key and the value. Whilst JSON does not by default support carrying a schema, Kafka Connect does support a particular format of JSON in which the schema is embedded. The resulting data size can get large as the schema is included in every single message along with the schema. Note the size of the message, as well as the proportion of it that is made up of the payload vs. the schema. Considering that this is repeated in every message, you can see why a format like Avro makes a lot of sense, as the schema is stored separately and the message holds just the payload (and is compressed at that). As before, remember that the converter configuration option (here, schemas.enable) needs the prefix of key.converter or value.converter as appropriate. This could be caused by the source topic being serialized in Avro or another format. This may be the most common error that I see reported again and again on places like the Confluent Community mailing list and Slack group. It happens when you try to use the Avro converter to read data from a topic that is not Avro. This would include data written by an Avro serializer other than the Confluent Schema Registry’s Avro serializer, which has its own wire format. 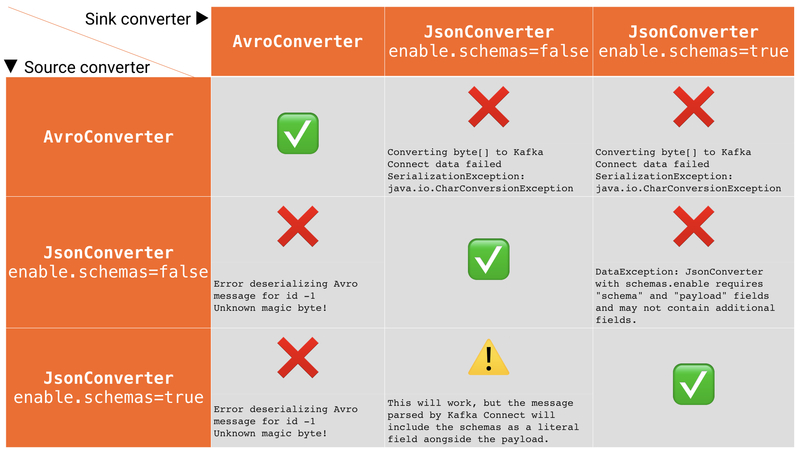 org.apache.kafka.connect.errors.DataException: JsonConverter with schemas.enable requires "schema" and "payload" fields and may not contain additional fields. If you are trying to deserialize plain JSON data, set schemas.enable=false in your converter configuration. To be clear, the only JSON structure that is valid for schemas.enable=true has schema and payload fields as the top-level elements (shown above). Let’s say we’ve hit one of the errors shown above, and want to troubleshoot why our Kafka Connect sink connector can’t read from a topic. We need to check the data on the topic that is being read, and ensure it’s in the serialization format that we think it is. Also, bear in mind that all the messages need to be in this format, so don’t just assume that because you’re now sending messages in the correct format to the topic there won’t be a problem. Existing messages on the topic are also read by Kafka Connect and other consumers. 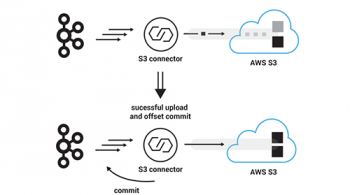 When run in distributed mode, Kafka Connect uses Kafka itself to store metadata about its operations, including connector configuration, offsets and so on. These Kafka topics themselves can be configured to use different converters through the internal.key.converter/internal.value.converter settings. However, these settings are purely for internal use, and indeed have been deprecated as of Apache Kafka 2.0. You should not change these, and you will get warnings from Apache Kafka as of version 2.0 if you do try to configure them. 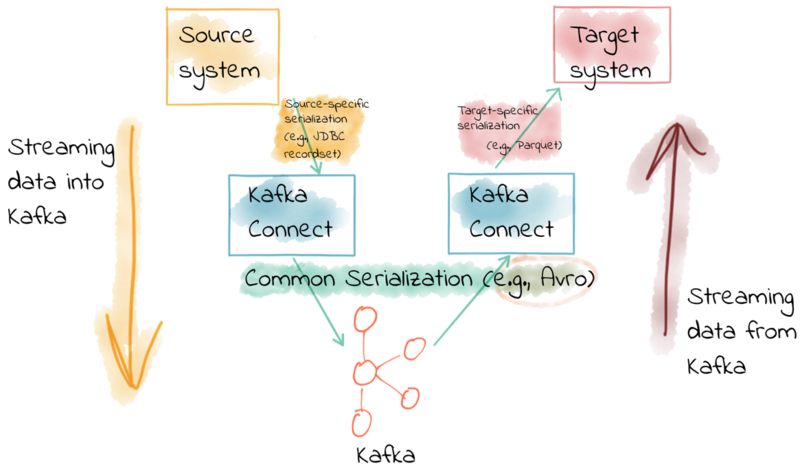 A lot of the time, Kafka Connect will bring data in from places where there is already a schema, and retaining that schema is just a matter of using a suitable serialization format such as Avro. All downstream users of that data then benefit from the schema being available to them, with the compatibility guarantees that something like Schema Registry provides. But what if there is no explicit schema? Maybe you’re reading data from a flat file using the FileSourceConnector (which is not recommended for production, but is often used for PoCs). Or, perhaps you’re pulling data from a REST endpoint using the REST connector. Since both of these, along with others, have no inherent schema, it’s up to you to declare it. Sometimes you’ll just want to pass the bytes that you’ve read from the source through and put them on a topic. But most of the time, you’ll want to do the Right Thing and apply a schema so that the data can be used. Doing it once as part of the ingestion, instead of pushing the problem onto each consumer (potentially multiple), is a much better pattern to follow. You can write your own Kafka Streams application to apply schema to data in a Kafka topic, but you can also use KSQL. This post shows how to do it against JSON data pulled from a REST endpoint. Let’s look here at a simple example of applying a schema to some CSV data. Obviously to be able to do this, we have to know the schema itself! If we leave the data in the topic like this, then any application wanting to use the data—whether it’s a Kafka Connect sink, bespoke Kafka application or whatever—will need to guess this schema each time. Or, just as bad, the developer for each consuming application will need to constantly go back to the team providing the data to check about the schema and any changes to it. Just as Kafka decouples systems, this kind of schema dependency forces a hard coupling between teams, and it’s not a good thing. Check that the data is as expected by querying the KSQL stream. Note that at this point we’re simply acting as a Kafka consumer against the existing Kafka topic—we’ve not changed or duplicated any data yet. Finally, create a new Kafka topic, populated by the reserialized data with schema. 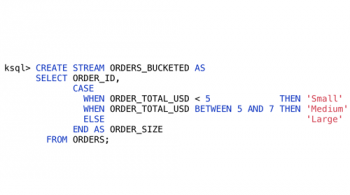 KSQL queries are continuous, so in addition to sending any existing data from the source topic to the target one, KSQL will send any future data to the topic too. "string": "Never Gonna Give You Up"
Any new messages written to the original topic (testdata-csv) are automagically processed by KSQL, and written to the new TESTDATA topic in Avro. Now any application or team wanting to use this data can simply work with the TESTDATA topic, and take advantage of the Avro-serialized data with declared schema. You can also use this technique to change the number of partitions in a topic, the partitioning key and replication factor. Kafka Connect is a very simple yet powerful tool to use for integrating other systems with Kafka. One of the most common sources of misunderstanding is the converters that Kafka Connect offers. 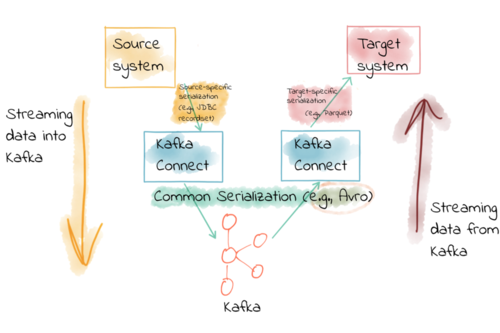 We’ve covered that Kafka messages are just key/value pairs, and it’s important to understand which serialization you should use and then standardize on that in your Kafka Connect connectors. Considering that this is repeated in every message, you can see why a format like Avro makes a lot of sense, as the schema is stored separately and the message holds just the payload (and is compressed at that). Hi, I’m very like this article ,and the picture is very clear,. I want to know which tool you use to draw, can you tell me ? reference will be OK, thanks! It’s an iOS app called “Paper”, from FiftyThree. What about when the Avro schema contains a nested array? Kafka Connect doesn’t seem to be able to handle arrays properly with the Jdbc connector.